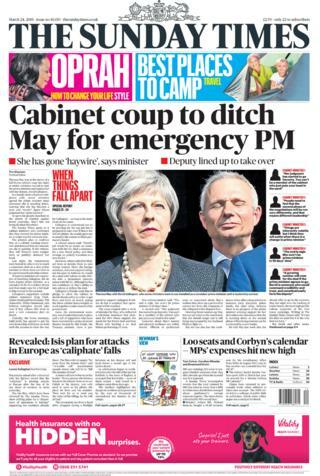 Prime Minister Theresa May is at the mercy of a “full-blown Cabinet coup”, with senior ministers seeking to replace her with her deputy, David Lidington, according to the Sunday Times. The paper says senior ministers agreed the prime minister must announce she is standing down, warning that she has become a “toxic” and “erratic” figure. 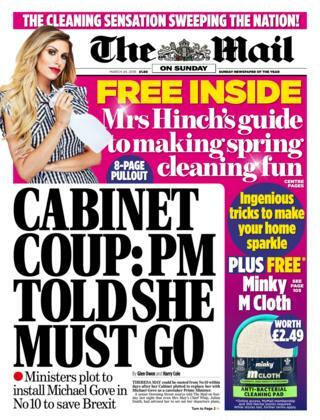 The Mail on Sunday also reports on a “coup” against Mrs May, but it says Environment Secretary Michael Gove is the preferred caretaker leader. The paper quotes a senior Downing Street source as saying that even Mrs May’s chief whip, Julian Smith, has advised her to set out her departure plans. The Sunday Telegraph also reports on frustrations with Mrs May’s premiership, quoting senior Tories as urging cabinet ministers to “step up” and remove her from her post. 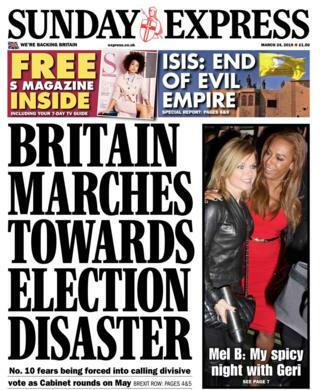 Meanwhile, in the Sunday Express, No 10 is said to fear being forced into calling a “divisive” general election. 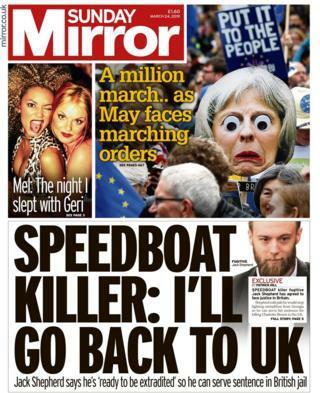 In other news, the speedboat killer Jack Shepherd has agreed to face justice in the UK, according to the Sunday Mirror. Shepherd, who fled to Georgia after being convicted of the manslaughter of Charlotte Brown, is said by the paper to have stopped fighting extradition so that he can serve his sentence in the UK. 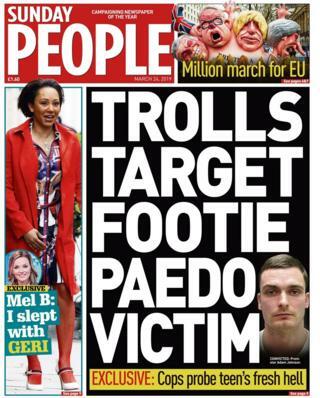 Trolls have targeted the victim of footballer Adam Johnson, who was jailed for six years for grooming and sexual activity with a 15-year-old girl, reports the Sunday People. The former Manchester City player was released from prison earlier this week. 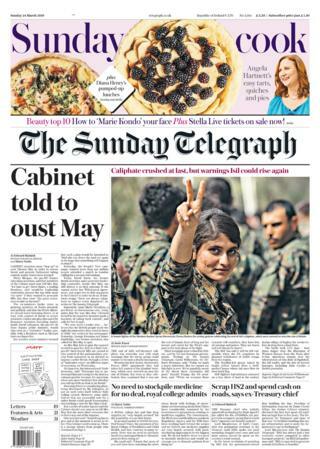 The words “cabinet coup” appear in several papers, including the Sunday Times. The paper says there have been what it calls ” a frantic series” of private telephone calls in which senior ministers are said to have agreed that the prime minister must stand down. The paper says it spoke to 11 cabinet members who described Mrs May as an “erratic” figure whose judgement has “gone haywire”. The Observer describes it as “historic” and says it was a “compelling demonstration of disdain” for the prime minister’s tactics and support for Brexit. It argues that a growing number of voters are unwilling to allow politicians to use a vague notion of “the will of the people” to drive through what it calls “divisive and potentially catastrophic agendas”. In other news, the man dubbed “the speedboat killer” has agreed to return to Britain, according to the lead story in the Sunday Mirror. The brass-plated stones are set in the city’s pavements and detail the names and dates of birth of those who died. The report says that Mr Sage’s efforts with cleaning fluid and a sponge have brought him extensive publicity since he started his mission in June.